Recent study by Health Canada gave shocking results. Researchers found bisphenol A leaching from the "BPA-free" bottles available in the market. Various earlier studies have shown harmful effects of bisphenol A on body. Some studies have also shown that this chemical, which is found in most plastic products, increases the risk of prostate and breast cancer in later age. The study that showed bisphenol A leaching into liquid in baby bottles become a issue of concern. Within a short span, market was flooded with "BPA-free" bottles. The recent study tested the claims of these bottles being totally free from bisphenol A. Researchers tested nine different brands of baby bottles using non-polycarbonate plastic. Research team was shocked to find leaching of the toxic chemical, bisphenol A, into liquid in these baby bottles labeled as BPA-free. 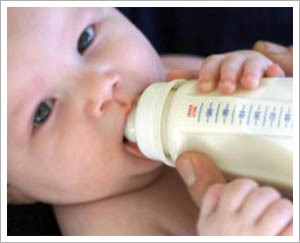 A famous "BPA-free" brand, Dr. Brown's Natural Flow bottle showed trace amounts of 0.9 parts per billion in the water when it was kept for 238 hours at 60 C.
Other brands like Gerber, Medela, Whittlestone, Nuby and a house brand sold at a dollar store in Canada showed trace amounts ranging from 0.002 to 0.025 part per billion.